Daan is born. In 74 discovers an harmonic tone while blowing his nose in an handkerchief. Plays sitar for 1 day in 76. Buys a Dutch transistorradio in 77 and gets hooked on hitparade’s. Doubts for the first time about the meaning of existence of music. Becomes member of ‘Sabam’ anyway with his own composition ‘Kaarslicht’. Together with neighbour Wim Claes(last seen producing Betty) records ‘Someone like you’,a hopefully lost recording. Daan meets some people from the late ‘The Passion of a Primitif’. They record 3 electronic songs, and sent a tape to ‘Humo’s rock rally’ as ‘Citizen Kane’. They end up in the finale. New-beat prophet and inventor Herman Gillis joins the band, which promptly changes their name in ‘Running Cow’. Soon they crawl in Hermans’ studio to work on their first single. ‘He’ll have to go’, the country classic by Jim Reeves is transformed by a Neneh cherry drumsample and overdone kitcharrangements. 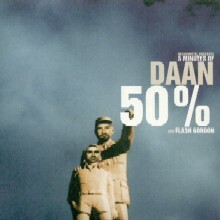 Herewith having reached an ambiguous, but for Daan the right tone, they dig up their drum-computers and samplers, and record ‘Gasoline on Fire’. The song reaches Wouter van Belle, who mixes and remixes the song. The radio plays this song-for a long time. After this 2 more singles follow, ‘Blue Caravan’ and ‘Goodbye Entertainment’. The pressure to bring out a full CD rises, but Daan starts to program silly, nihilistic synthpop. EMI, the sponsor of ‘Running Cow’ does not see the funny side of this, Polygram does. ‘Volt’, as the band is named now, brings out the record ‘Modern Times’. A tricky ‘light’ single is released, ‘They’re going to sample me’, and it works. Everybody is shocked by the bombastic retropop, but that is all. The 200 people who bought the record, and the 3rd single ‘Interzone’ which finally gets some airplay, cannot save the project. Daan starts working for the music- and comercial industry as graphic designer. The years in Antwerp pass by, tied to a pc-monitor, caught between telephone and fax. And even though the graphic assignments are allright, too much is too much. Stacks of CD-covers and rockposters, an endless stream of useless, smooth campaigns for American soft-drinks and sigarettes, German cars and Belgium banks, this screams for an antidote. And here is the music again, but with a strictly therapeutic purpose. At night, with an old guitar, a cheap supermarket-announce microphone and a 4-track revenge is taken on so much consumption stress. Angry songs, cynical songs, nothings, naïeve electro, singer-songwriter fiddles, pure pop, intimistic country and above all all of these mixed. Escapism rules. Stacks of songs which are of no interest to anyone, but the feeling is more pure as ever before. 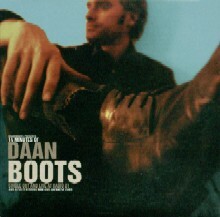 Only one time does Daan visit the studio, to record and release the single ‘Geen Franse wagens meer’ with the collective ‘Supermarx’. The laughter and confusion in the media and the threatening of lawyers eventually lead to a full censorship of the song. After this joke Daan withdraws contently to his cassette player and computer, which is used to cut and work out songs. This solitary fiddling could have lasted long, were there not Rudy Trouvé, who as a 4-track fan starts a conversation with Daan on a drunken wedding. After that things move fast. A bunch of improvisationcassettes, riffs and patterns, Herman Houbrechts and Elko Blijweert joining, the first single, the full CD ‘Berchem’ in april 98, their own Heavenhotel label, enthousiastic press, wondering radio, live sessions, a third single, ‘Chemical’, support from Wallonie, festivals…..
By the end of 98 Dead Man Ray works on a soundtrack for ‘At the drop of a head’, a forgotten film with Bobbejaan Schoepen, which tours throughout the country the start of 99. But still there is time and energy, and the songs from 93-98 are not finished yet. The primitive recordings and first-takes full of tired guitars, cheap organs en toysounds are pulled through the mill for the last time.. Daan plays drums over it, pulls everything through Herman Gillis’ famous filterbank. He finds a line in the lyrics, fed by the dayly portion of chaos and citylife in changing appartments and as many different looks. The end-result, a bunch of humunogenous, brute but hypnotizing songs is mixed with the help of Karl Broekaert. 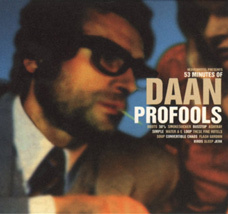 In March 99 the full CD ‘Profools’ is released, a title which ends an era in which Daan was so foolish as to work. To perform live Daan asks keyboard player Guy Van Neuten(ex brain of the Sands), who played some of the organs on the CD already, and Dago Sondervan, a drummer and programmer, who as Anton Price floods the Drum ‘n bass electro scene with his selfpressed vinyls. This live-combination sounds like a 60s beatrecord, of which the needle skips randomly. After a long summer of performances, which already indicate ‘The Shape Of Things To Come’ with their electrocrooner interpretations of the album ‘Profools’, Daan celebrates the end of the century with the birth of his son George. Behind the scene he helps out with Novastars debutalbum, which is most obvious in the first single ‘Wrong’. Dead Man Ray signs a contract with Virgin and releases a 2nd CD ‘Trap’ in march. The French press discover the band, and so do the Germans through Rockpalast. Meanwhile Daan is experimenting with video. Together with Herman Gillis he produces ‘Elektroménager’, an abstract sound-to-vision transformation, which is shown on the videofestival in Dallas before his music ever reaches the USA. Also with Dead Man Ray some experimental video’s are made. Meanwhile he survives by composing comercial tunes for(once again) German cars, Swedish disposable furniture en fusing banks. By the end of 00 Daans sountrack for the Brussel movie ‘Verboden te zuchten’ is released. A composers cut from a year fights with the medium serious film. In november the new solo-CD to be gets an electronic-jazzy injection during 2 weeks of recording with Anton Price in a remote chalet in the ardennes. A new year, a new environment: Filip Vanes takes over the management, Ton van Draanen the bookings. The young Belgian band ‘Rumplestiltskin’ tasts as first from Daans unorthodox production recipe with the single ‘Voodoo smile’, and Ambrozijn sees his song ‘Mars’ transform from folk to pure spacepop. Dead Man Ray leave for France and Swiss in a black-painted tourbus. Daan performs solo in a bunch of well-received solo-gigs, in which he accompagnies himself with on the spot looped riffs, which already announce the symphonic character for the new release. This 2nd CD is expected for the end of 01.